There were no fewer than 3 course records broken on a sunny Summer’s morning at Battersea Park yesterday. Unfortunately I knew going into this race that the only record I’d be breaking, in fact creating, was a season’s best. Yes, yesterday was my first 10K race since all the way back in August 2010 when I equalled my PB of 34.59. Realistically going by my time in last weekend's 5K, anything around the 36 minute mark would be an achievement. 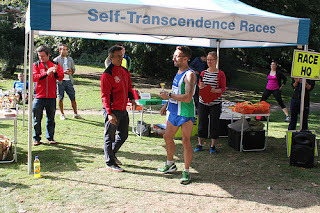 The race was the Self Transcendence 10K, which consisted of 3 loops of Battersea Park. I am no stranger to this course, as it’s where I did a lot of my training last year - some painful memories! I actually did this very race last year in a time of 35:25. It is as flat as a pancake and on tarmac and therefore prime PB territory. Joining me in the starting line-up were a couple of familiar faces. The legendary Darren Tanner, who has been in fine form this year with three 10K wins so far. I certainly wasn't planning on trying to keep up with him yesterday. Also competing in his debut 10K race was my good friend Mark Cameron. A fit young fellow who has run half and full marathons before but has never raced the 10K distance. I went into the race aiming to start conservatively as I am sick of making the same old mistake of going out to quickly and flagging in the later stages of races. So I let DT fire ahead of me, I had to run my own race. It seemed to work well as I was able to settle into a pace of around 3:30 a km and I was going past other runners even at the 4K mark. Inevitably with my lack of mileage I wasn't even able to keep up this pace and it hovered around the 3:35 mark until the last K where I pushed the accelerator knowing I was close to home and posted my fastest K of the race in 3:22! When I came onto the final straight, I saw the big clock which was still under 36 mins. As soon as I realised I had a tight chance of getting sub 36 I pressed the extra boost button and absolutely hammered it towards the line. To my delight I crossed the in 35.58. At this point I made a lot of noise which DT had to explain to those in earshot was partly down to my return from injury. The other boys added to the joy with Darren coming in 5th place with a great time of 34:50 and Mark exceeding his expectations with a terrific 42.35. Darren’s 5th place meant we had some interest in the prize giving as trophies were awarded up to 7th position for men under 50s category. Below DT collects another award for his straining trophy cabinet. Afterwards, we had a deserved breakfast in Battersea with friends. And yes there were a couple of lagers consumed later on in the day (in my case, after my shift at work). Now to reflect on the race and a look at where I am now. The good news was that I was only a minute away from last year’s PB, which is no mean feat considering the length of my layout. I did put in a hellova lot of hard training the last 3 weeks though so it just shows you what you can do if you stick religiously to a challenging training plan. The bad news is that I am still getting various pains in my shin. I am continuing to try and combat this with a variety of measures. I have been keeping up the yoga, and did my 2nd session in a week today, in a bid to improve my strength and flexibility. I am also investigating getting a proper biomechanical analysis done to try and identity what may be causing my issues and any weaknesses that I can work on. Hopefully it will all become clear one day, until then I’ll try and do as much running as I can without breaking myself. Next up is the Regent’s Park 10K on 7th August. Then I will have a 3 weeks training cycle before another 10K in Regent’s Park that I came 2nd in last year and equalled my PB. Sub 35 again by the end of August would be nice, although I’ll still have the nagging feeling of not having made any progress for an entire year. 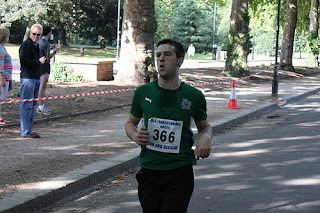 As for the course record at Battersea Park, I’m determined to get it before I am no longer a Londoner! 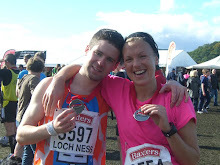 It’s high time this running blog was put back on the road. Thankfully I now have something of worth to write about as I sit supping on a cold bottle of lager, not long after a successful 16 mile run (my longest since October) and the day after achieving 5K PB. I’ll try and fill in the gap since my last post all the way back in January. I’ve continued to spend 2011 soul searching (dramatically) and trying just about every possible cure and reading just about every article or website every written on shin splints. I’ve also spent a lot of money on physio and trainers. Nothing seemed to work. After yet another failed comeback I decided to just keep going and see what happened as the pain wasn’t actually that bad. I can’t remember why but I just started to try to run more on grass instead of the road all the time. I’ve recently moved to Greenwich and nearby Blackheath provides an excellent chunk of grass! Since this change in tact I usually don’t experience any pain. And when I do it’s usually after a long session on the road and it seems to go away. So I think I’m now just trying to mitigate the pain coming back by doing a higher % of my training on softer surfaces like grass and the track. I was always doing a weekly track session so the main difference to my regime has been ‘offroad’ runs. It’s taken me a while to accept, that pounding the roads for hours a week is just not sustainable. So instead I will skip through the green spaces of London. It looks like it’s something I’m just going to have to manage, and with any luck it might go away as my legs get stronger and more conditioned for long distance running. Maybe I’ve just made that up, but at least it’s hope. Also, I've gone to the lengths of taking up yoga! I feel a bit out of place and must be pretty close to the bottom of the class but I really feel it must be helping improve my flexibility and strength. It certainly causes me a lot of distress during the classes! Anyway, to the comeback trail. I’ve been flirting with the parkrun the last few weeks to try and get back in the groove of quick running. The parkrun is a fantastic concept and I can’t praise it enough. They are 5K timed runs (as with everything I treat them as races!) every Saturday morning which takes place in locations all over the UK and beyond. Register on the website, turn up at any course you want with your printed barcode, run with a great bunch of people, get a time, and all that for free – thanks to the generous volunteers who often sacrificing running themselves. It’s all explained better at www.parkrun.org.uk but I would urge anyone interested in running for fun or seriously to get involved. During my latest training I have shoe-horned in a few parkruns to try and get an idea of where my fitness and pace is. This was my first race since the start of October, so I didn’t really know how I’d deal with the rigours of a 5K. I always need a target though so I went in with an educated expectation of doing it in around 18 mins. With so many months out with only very irregular training it was always going to be difficult to emulate anywhere near my pace from last year. The course also has a couple of hills and is all on grass, which isn’t conducive with getting a fast time. It was a struggle, but then I find every race a struggle as I push myself to the limit. I should have been happy with 18:12 and even came 2nd! Not bad after about 9 months since my injury problems started. I couldn’t wait until the next week though to improve on this and try and get closer to last year’s pace. Time: 18:12 (SB) – Target met! Now that I knew the course and had another week’s training under my belt including a couple of track sessions, I had great expectations that I would knock a bit of time off last week’s effort. I was hoping sub 18 mins at the very least. Somehow I found the pace and energy to knock a whole 15 seconds off. Of course I still wasn’t happy. I knew I had 2 weeks of training until I’d be able to do another parkrun though so was confident that if I kept going at this rate I could make some serious inroads. One of these weeks I was spending in Scotland so had some great training sessions on some hilly routes. Time: 17:57 (SB) – Target met! Now for a change of course. After checking out the parkrun courses that London has to offer, it was clear that Hackney Marshes would be a fast course as it’s flat and mainly on tarmac. With this in mind and the fact that I’d just done a couple of weeks of hard training I turned up in confident mood. I wanted to get as close to my 5K time from last year as I could, so anything around 17:30 would be satisfactory. As usual, I started very quickly but struggled to keep up this pace by the time I was starting the 2nd K. However looking back at the km splits I was actually fairly consistent. I often have some sort of calamity the first time I try a course and the marshes was no different. It is a 2.5km out and back course and a few seconds from the start you need to turn off through some bushes on the right –I managed this fine but couldn’t work out where to turn in on the way back. It costs me a few seconds although it did force me into a aprticualry strong sprint finish and I was pleasantly surprised to take 8 seconds off my PB from back last June! Time: 17:21 (PB) – Target smashed! As a PB, it was slightly misleading. This was definitely a faster course than Finsbury Park and I only did two 5Ks last year, the last one being back in June which was a couple of months before I achieved a sub-10K. So I still feel I’m a bit off my 10K pace and I’ve got a lot of work to do before I’m able to maintain pace at longer distances. But I have started my weekly long run again so that will definitely help. Next on the radar are a couple of 10Ks. Battersea Park on Saturday and then Regent’s Park on the 7th August. I see this all as build up to my big comeback race, the Great Scottish Run, a half marathon the 4th September. I did this last year in 1:17:08 which is probably my best running performance to date. With only 6 weeks to go it would be a massive ask to match this time again. So instead I’m going to try and beat it by a couple of minutes! A very tough 6 weeks of training ahead! Thanks for staying with me and thanks also to all those volunteers at parkrun. It’s going to be my turn to volunteer very soon! Whoops that was a bit long.